Selenium is a trace mineral that is necessary for the way a horse functions. It acts in conjunction with Vitamin E as anti-oxidants, protecting cell membranes from destruction. However, too much or too little selenium can have adverse effects. A deficiency of selenium can cause muscle disease, impaired heart function, difficulty swallowing, respiratory distress and more. Selenium toxicity includes sweating, staggering, diarrhea, colic, increase in heart and respiration rates, loss of hair, damage to the structures (laminae) that surround the bone, attaching it to the hoof wall. In general, between 1-3 mg. of selenium daily is considered enough and a safe level. Knowing the amount of selenium in the horse’s feed and having samples of the forage analyzed can determine the amount of selenium ingested by the horse. 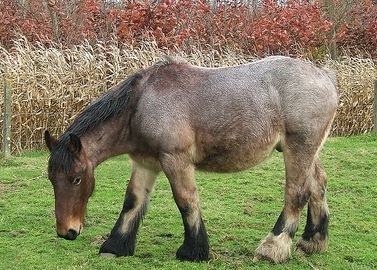 Researchers have discovered that selenium remains stable in a horse’s hair for a long time. Samples of mane and tail hair can determine not only concentrations of selenium, but also the amount of time of exposure, up to 3 years in some cases. While blood and serum tests have been used in horses suspected of having either selenium toxicity or deficiency, they only tell of recent exposure. Hair analysis is a more accurate test of selenium amounts.